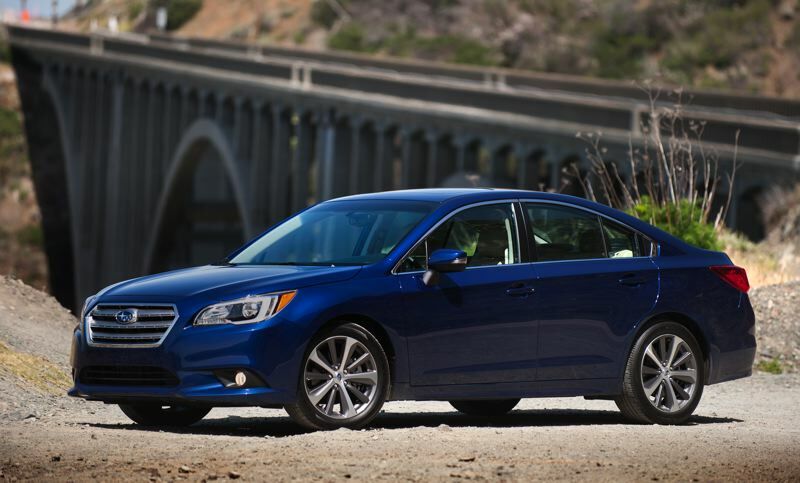 The 2015 Subaru Legacy Review: Subaru has staked its reputation on all-wheel-drive cars. Every Subaru for sale these days sends traction to all four wheels. That’s why these cars are so popular in places like Colorado and Vermont, where there’s lots of snow and mountainous terrain, and the Pacific Northwest, where the roads are always wet from rainfall. The only problem is that all-wheel drive cars burn more fuel. The last generation Legacy was rated for 32 mpg on the highway, which is drastically worst than the 40-plus mpg its most efficient competitors are achieving. Well, now there’s good news for Subaru fans. The Legacy sedan has been completely redesigned, and the engineers spent much of their time focusing on closing that fuel economy gap. Despite the new Legacy being roomier than ever before, including the most spacious cabin of any mid-size car, according to Subraru, it’s also bumped the highway mpg rating all the way up to 36, which is remarkable. Think about that for a second. It’s bigger than most mid-size cars. It’s sending power to all four wheels. Yet it’s getting the same fuel rating as a compact, two-wheel-drive 2015 Honda Civic with a manual transmission. To hit those impressive numbers, Subaru took a lot of steps to reduce weight on the new Legacy, including using an aluminum hood. It also installed a continuously variable transmission (CVT). And while I’m generally no fan of CVTs and liked the heavy, solid feeling of the last generation Legacy, it reminded me of a German luxury car in many ways, this new one feels more in tune with the times. And Subaru’s upgraded EyeSight driver assist system gives it almost the same high-tech safety vibe as a new Volvo. Features like adaptive cruise control, pre-collision braking, lane departure warning, steering responsive fog lights, blind spot detection and rear cross traffic alert make it feel like the electronic guardian angels are always looking over the driver’s shoulder. I also like two other things about it: the premium-feeling cabin and the level of safety equipment you can get on it. The cabin materials and construction are as good as anything in the industry right now. Switches feel tightly installed, and lots of materials are soft to the touch. The Bottom Line: The 2015 Legacy is focused on making the new Subaru bigger with a roomier cabin, while also keeping its weight down to a minimum. Its highway fuel economy is up to 36 mpg, which is impressive for an all-wheel-drive vehicle. Tight-fitting switches and soft materials take the Legacy’s cabin up to a premium level. It’s just a great overall sedan for people who value traction, comfort and safety. And maybe, just for those reasons alone, you should “Drive one, Buy one, Today ©”.